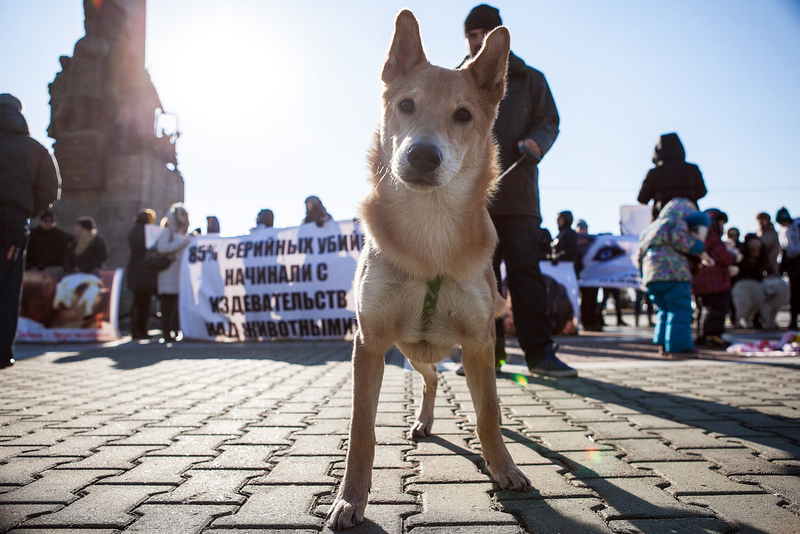 People rally against animal abuse and demand toughening the laws concerning animal abuse and murder, and a just punishment for the two Khabarovsk natives aged 17 who tortured more than 15 animals and uploaded the videos to the Internet. Russian society has been outraged by the case of two teenage girls who dismembered animals on camera. RBTH finds out about animal rights in Russia and how cruelty towards animals is punished. Russian society has been shocked by the actions of two teenage girls from Khabarovsk (3,800 miles east of Moscow), who would take animals from shelters and cruelly torture and kill them, before posting their bloody selfies on the internet. Now animal rights activists are signing petitions, posting denunciatory statements in social networks and demanding that the sadists be jailed. According to a representative of the Umka charity foundation for homeless animals, punishment for cruel treatment is “very mild” and the police is usually uninterested in examining denunciations concerning this behavior.” “An enormous number of horrific cases go unpunished,“ said a spokesman for the Zashchita Zivotnykh (Protection of Animals) social organization in Tikhvin (400 miles north of Moscow). In accordance with Article 245 of the Russian criminal code, the cruel treatment of animals is punishable by a fine of up to 80,000 rubles ($1,271) or six months in jail. If several people are responsible for torturing the animal, the fine increases to 300,000 rubles ($4,769) and a two-year prison sentence. However, in reality severe punishment is rarely meted out. According to the RosPravosudiye jurisprudence archive, in the last 10 years there have been no more than 716 cases dealing with Article 245. In many cases the animal killers were acquitted. The State Duma has examined harsher laws with less vague wordings, but none have been passed yet. Perhaps the reason is that animal rights activists are fighting not only sadists but also businessmen who are profiting from the maltreated animals. The government's passivity in issues concerning legal regulation is partially compensated by civil activity. The girls from Khabarovsk were recognized and identified by internet users, after which the police investigated the case. The petition calling on criminal charges to be filed against them gathered 420,000 votes. Now the two girls from Khabarovsk may receive a two-year prison term. Concerned citizens are able to influence not only individual situations but also the global picture. In 2008-2009, after a powerful social campaign, Russia banned baby seal hunting, while in the early 2000s youth and animal activist protests forced Moscow's authorities to cancel a planned bullfight. However, when citizens take justice into their own hands they often abuse it. Some activists from animal rights sites have been accused of fraud: They collected money for maltreated dogs only to later disappear. Animal lovers are particularly harsh toward dog hunters – people who wilfully set out to kill stray dogs. Animal activists publish dog hunters' personal information online, leading to illegal mobbing and threats for the hunters from ordinary citizens. Less aggressive initiatives have more chances of success, even occasionally on an administrative level. Widespread indignation among Moscow residents over mass sacrifices on the Muslim holiday of Eid al-Adha resulted in the capital's authorities prohibiting the public slaughtering of sheep. And in 2005 the St. Petersburg administration made it illegal to beg with animals. The poor would often beg for money to feed their dogs but in the end spent the money on themselves while keeping the animals in horrible conditions.